Once you have a pasta dough made, your next step is to roll it out into sheets, from which you can easily make long pastas, like spaghetti and linguini, or cut rounds for raviolis or other stuffed pastas. By hand: I’ve never even tried to roll out pasta dough, but hand. If you want to give it a go, that’s great, but frankly it’s a bit to laborious for me. By manual machine: They sell pasta machines with the hand crank that you manually operate, and I confess, I only used one once. I’ll also confess, I didn’t like it. The big issue is that the machine really requires three hands. One hand to turn the crank. One hand to feed the pasta into the rollers. And one hand to catch the pasta as it comes out. I’ve only two hands, and nobody wants my feet touching their pasta. Electric machines: So my choice is an electric pasta rolling, that turns the rollers automatically and allows you to feed the pasta in with one hand, and collect it as it comes out with the other hand. They are not super cheap (generally over $100), but if you’re going to make pasta, I think it’s worth the investment. Regardless of what process you choose to roll out the dough, the process and goals remain the same. The first 8 – 10 times you pass the pasta through, you’re really kneading the dough, and helping to build that elasticity. After that we roll it into sheets. If needed, cut the dough ball in half, or smaller, so it’s not too large to work with, and flatten it out with your hands into a disk shape, so that you can feed it into the rollers more easily. Run the pasta through the rollers at the widest possible setting (usually marked “O”). 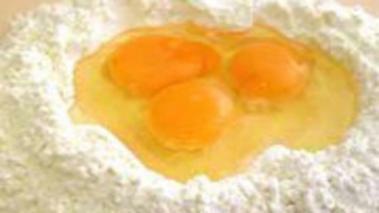 Once through, fold the dough in half, and then roll it through the pasta machine again. This time, turned 90 degrees so it goes through perpendicularly to the previous pass through. Repeat this process 8 to 10 times, which further kneads the dough. Change the roller to the next setting (one space narrower) and roll the pasta through. We’re no longer turning the pasta 90 degrees and feeding it in, you continue working in the same direction. At the narrower setting, the pasta becomes thinner and longer. You don’t need to run the pasta through the same setting more than once. Rather, change the setting to next position, and run the pasta through again. You now have pasta sheets that you can do a number of things with. If you have the pasta cutting attachments for your roller, you can pass the sheets through and make whatever cut you you’d like. You can also cut spaghetti shaped pasta with your knife, by rolling the sheets up like a scroll (dusted with flour to prevent sticking), and then slicing through the roll. Then unrolling the cut pieces you’ll have long spaghetti. You can also cut rounds, squares, triangles or any other shape (large or small) and make stuffed pasta. You can freeze as is and take it out whenever you want - I tend to make more than I’ll eat at any one time.